The new Emergency opens on March 7, 2018. The entrance and parking are changing locations. Please follow signage. To view a hospital plan, consult Contact Information. The Emergency Department at Hawkesbury and District General Hospital (HGH) provides urgent medical care for adults and children with acute injuries or illness. Our physicians and nurses treat close to 60,000 patients yearly in our acute and ambulatory sections. Urgent cases have access to X-ray, ultrasound, CT scan and laboratory services. The Emergency Department (ED) operates 7 days a week, 24 hours a day. When should you come to the Emergency? You should come to the ED when you have a health problem that requires urgent attention. If you are unsure, please call Telehealth Ontario at 1-866-797-0000 or Info-Santé Québec at 8-1-1. It is not appropriate to come to the ED for form completion, referrals or second opinions. Please note that we do not renew prescriptions or provide routine ambulatory care or follow-up for chronic problems. When should you call an ambulance to come to the hospital? If you have a serious or life-threatening condition like a stroke, a heart attack or serious trauma, you should call 9-1-1. If your condition makes walking or driving too dangerous and you cannot have someone take you to the hospital, call 9-1-1 for an ambulance. I need medical care, but it’s not an ‘emergency’. Where do I go? Going to a walk-in clinic or a family doctor would be the best option. To find one of them, check our Resources and links section. What happens when you arrive at the Emergency? Upon arrival, a triage nurse will assess your condition. You may then be sent immediately to an examination room or for an X-ray. Some less urgent problems are seen rapidly in our EDAS (Emergency Department Ambulatory Service), open from 8:00 a.m. to 10:00 p.m.
You may also be asked to return to the waiting room and your name will be called out when it is your turn. The sickest patients are treated first. The ED does not apply a first come, first served system. 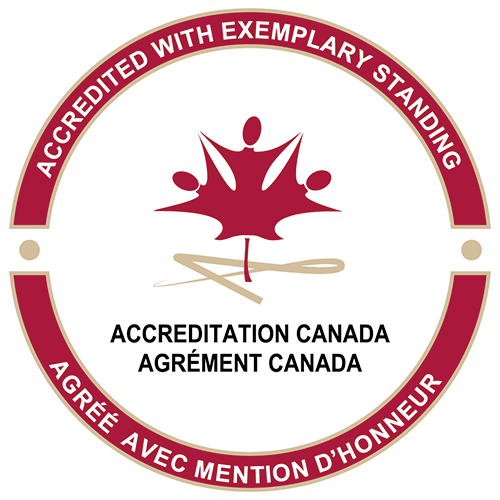 We apply the Canadian Triage and Acuity Scale (CTAS) to determine the order in which physicians see patients. How long will you wait before seeing a physician? Coming by ambulance does not affect the time until seen by a physician. It depends on how sick you are. To avoid losing your turn if your name is called out, inform the triage nurse if you leave the ED for a few minutes to go to the washroom or to get a snack. If you have been waiting for more than 90 minutes and a physician has not seen you, please check in again with the triage nurse. How long will you stay in the Emergency Department? Once you see the physician, your length of stay will depend on the required tests and treatments. For example, getting blood test results takes from 60 to 120 minutes, while an X-ray exam will add 30 to 60 minutes. A CT scan could take from one to 5 hours. Our physicians may also keep you under observation in the ED to ensure that the treatment you received is helping or to see how your condition changes. What to do if your condition gets worse? If your condition worsens before you see the physician, please advise the triage nurse. Who can stay with you while in the Emergency Department? To ensure safety and confidentiality, only one person is allowed to stay with a patient in the ED. This support person should act as the key contact between the staff and family members in the waiting area or at home. Sometimes patients start to feel better, have to go somewhere or do not want to wait any longer. We discourage patients from leaving before being seen by a physician. However, if you decide to leave, please talk to the triage nurse prior to leaving the ED. Sundays, Mondays and Fridays are usually busier. However, it is important to note that any day can be very busy in the ED. Evenings are often our busiest time. Nevertheless, it can also be busy outside of these times. During the night, a single ED physician is on call for all HGH patients and emergencies. Unless you are very sick, you may only be seen when the morning doctors arrive. To check on someone’s condition – the number should only be called if no family member or support person is available. Call 613-632-1111 and dial 0. The entrances to the building and parking lot have changed. The new Emergency Department is located at the east end of the hospital. There is limited parking near the Emergency Entrance. You may also use the Visitor Parking and the Main Entrance to get to the Emergency. Please follow signage. 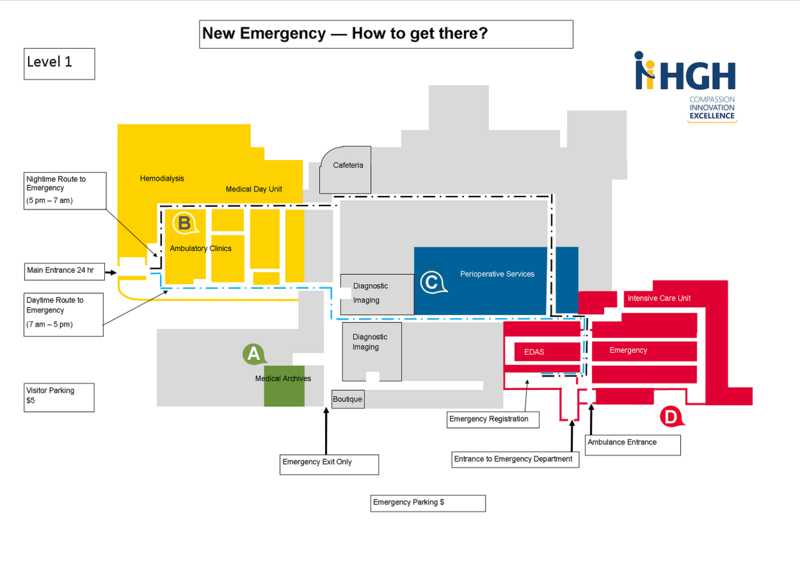 The plans below show you how to get to the Emergency. To find health services in Prescott-Russell, visit Champlain Health Line. For information on CHEO’s Emergency Department, visit CHEO. To find a family doctor or a nurse practitioner in Ontario, visit Healthcare Connect. To find urgent care centres, walk-in clinics, pharmacies and other healthcare services in Ontario, visit Health Care Options near you. For telephone information and advice about potential or real exposures to poisonous substances, call 1-800-268-9017. For free, confidential telephone service to get health advice or general health information from a Registered Nurse, call Telehealth Ontario at 1-866-797-0000. The service provides round-the-clock access to a qualified health professional. It can help you decide whether to care for yourself, make an appointment with your doctor, go to a clinic, contact a community service or go to a hospital emergency room. For more information, visit Telehealth Ontario. To register onto your CSSS (Centre de santé et services sociaux) waiting list to access a family doctor, visit Portail santé mieux être Québec. Info-Santé is a free and confidential telephone consultation service for Québec residents. Dialling 8-1-1 promptly puts you in contact with a nurse in case of a non-urgent health issue. The service is available 24 hours a day, 365 days a year. For more information, visit Info-Santé. For information on when to use the Emergency Room or not, visit Montreal Children’s Hospital. For information about the Mother and Child University Hospital Centre in Montreal, visit CHU Sainte-Justine.